Sports were a major art of Brian Tarpley’s life at Wooster High School. When he entered his sophomore year in the fall of 1069, he picked up his initial varsity letter as the starting middle guard for the Generals. At the end of the season he donned his trunks and gained a second monogram as a point guard on the basketball squad. Finally, with the coming of spring he grabbed his glove and brought home a third letter as the General shortstop. Brian duplicated these efforts in his junior and senior seasons, garnering a total of nine varsity W’s in the three major sports. 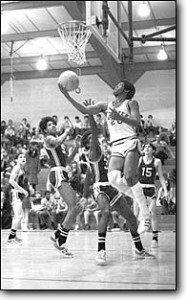 His prowess was such that he was given the award as outstanding senior athlete in 1972. His football abilities were such that he was switched to defensive end as a junior and played both offensive and defensive end as a senior. In 1970 he was first team All-Cardinal Conference as a defensive end and was also selected as an All-Ohio Class AAA honorable mention pick as lineman by the UPI. Brian went on to Bluffton College where he proceeded to start for the Beavers in both football and baseball for four seasons. He continued his stellar performance at the defensive end position being twice selected as an All Buckeye Conference performer. His baseball efforts were even more noteworthy. He led the conference in batting as a freshman and went on to establish six school records for the Beaver nine. He picked up the reins of player-coach his senior season when after the unexpected death of this coach he led Bluffton to the district playoffs. “Tarp” began playing slow pitch softball after his college years were finished and he has been one of the outstanding area performers in that particular sport. His play has resulted in his selection to many all-Tournament teams around the state.